The Kershaw Cryo is a winner. Not just in design, but literally. It won Blade Magazine’s “Best Buy of the Year” award in 2012 and since then has been a well-known and trusted product of Kershaw’s. It brings a simple and subtle approach to the EDC knife. But don’t be fooled. For its reserved look it packs quite a punch, and as so, deserves it’s acclaim. Kershaw is at the forefront of the pocket knife industry. They’re innovative, passionate and certainly know their way around a knife. Since forming in 1974 they’ve gathered a wealth of knowledge, producing some of the best knives on the market. Their craftsmanship is reflected by their consistent winnings at the Blade Show awards. In 2007 they unveiled their Composite Blade technology. An innovation that consequently won them Blade Show’s “Overall Knife of the Year” award (for the Tyrade model). With a closed length of 3.75 inches and a weight of just 4.2 ounces, the Cryo is perfect as an EDC knife. For its length, the Cryo is slightly heavier than you would think. But don’t get me wrong, this doesn’t hamper its effectiveness. It’s balanced well and as a result the weight only makes for better cutting action. Perfect for people who like having a bit of weight to their knives. However, the compromise is that it feels heavier in the pocket. Not by much, though. Made from 8Cr13MoV steel and coated with titanium carbo-nitride, the blade looks great. The finish in particular gives the 2.75 inch blade a hint of elegance. When sharpened, the straight-edge blade is really sharp and hold its edge for a good amount of time. The tip of the blade is also very fine making it great for detail work. For the Cryo, Kershaw has used a stainless steel handle. This accounts for that extra weight. 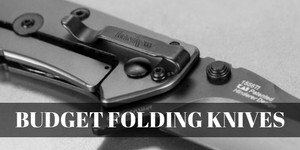 Fitted with Kershaw’s signature Speedsafe deployment system, it’s simple and fast to open. Done by pushing the thumb-stud or pulling on what’s called the “flipper”. The steel handle is finished with the same titanium carbo-nitride you see on the blade. This makes for a sophisticated look that’s featured among the Cryo models. The only fault I can find with this is that users from colder climates may need to circumvent a cold hand problem by wearing gloves. With jimping in all the right places, it’s not hard to keep your grip. As far as the ergonomics are concerned, it’s well designed and easy to control. If you’re looking for other models there are of course different colors and finishing schemes available in the Cryo range. If you’re looking to go for a slightly larger and lighter knife, your best bet would be the Spyderco Delica 4. With a closed length of 4.25 inches and a significantly lighter weight of 2.5 ounces, this top-quality knife is perfect for any EDC knife needs. Even greater improvements have been made from the original, the Cryo G10 is now offered with the G10 handle material. And the Cryo II, which is a slightly larger variant of the original Cryo, is available as well. The Cyro II is 20% larger, with a blade length of 3.25″ and an overall length of 7.75″. With the 20% increase in size comes weight, the Cryo 2 comes in at a hefty 5.5oz, putting it slightly on the heavy side, but still suitable for an EDC. However unfortunately, the Cryo 2 isn’t yet offered with the G10 handle material option. Kershaw is good about listening to what the customer wants, so I’d expect one day they will have the G10 available for the Cryo2. Overall, there’s no questioning that the Kershaw Cryo is a good knife. Possibly even a great knife. For its size, it’s great as an EDC knife. With a little bit of extra weight it’s easier to get behind some tougher projects and deployment is a breeze with Kershaw’s Speedsafe technology. With its simple design and titanium carbo-nitride finish, it has a certain finesse. Handy, portable and classy – the Cryo lives up to the award-winning Kershaw name.